In June 2016 the start of summer, I rode the Amtrack train to Seattle, Washington from Berkeley, California. 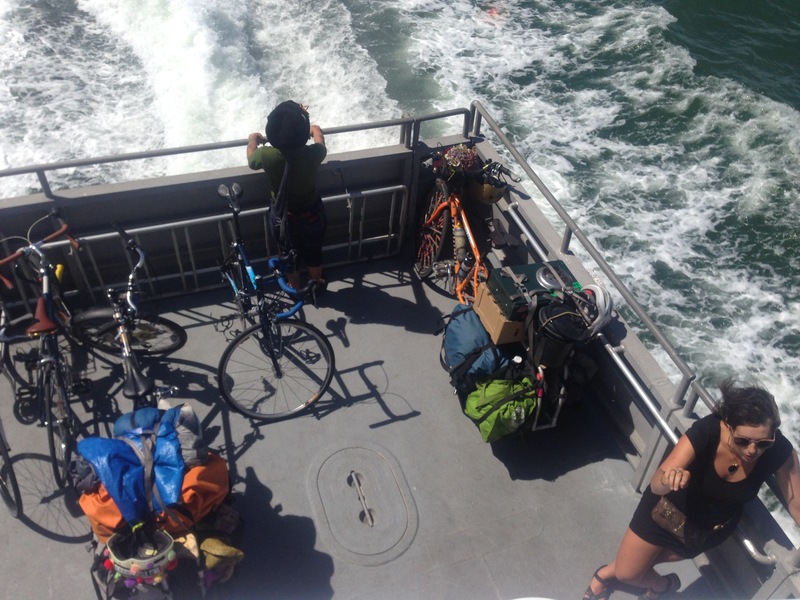 24 hours by train with my bicycle panniers and an extracycle bicycle that I had boxed and ready for shipping. 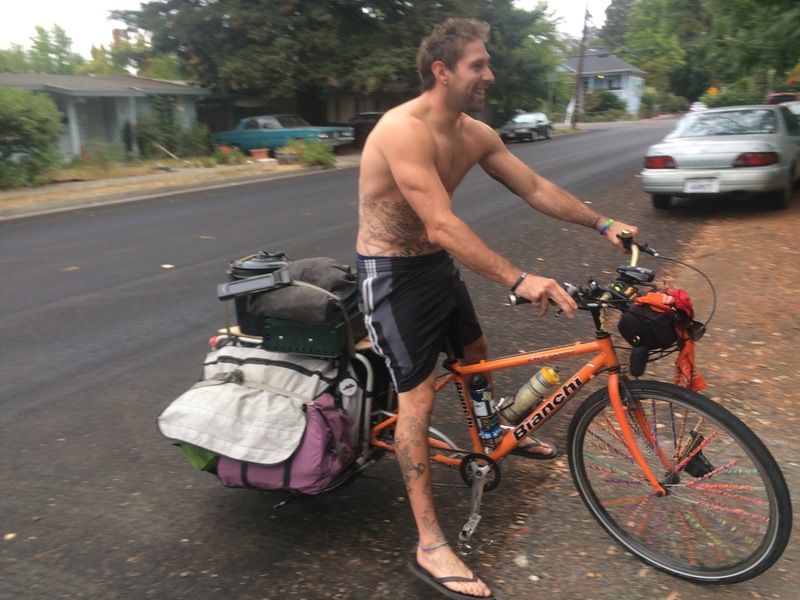 From Seattle, I joined with 12 other cyclists and we started out on a journey that would last 2.5 months and over 1,500 miles of pure cycling. 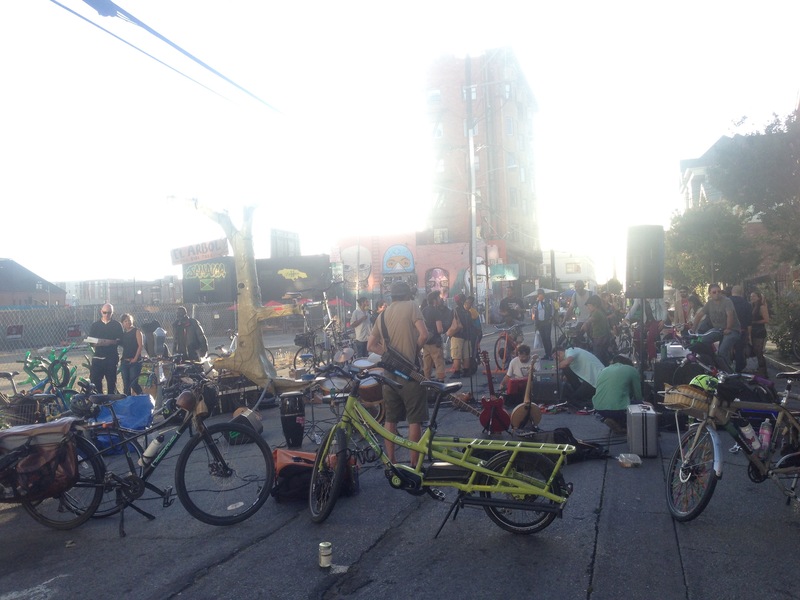 We organized over 31 human powered festivals with the 4 bands on bicycles. 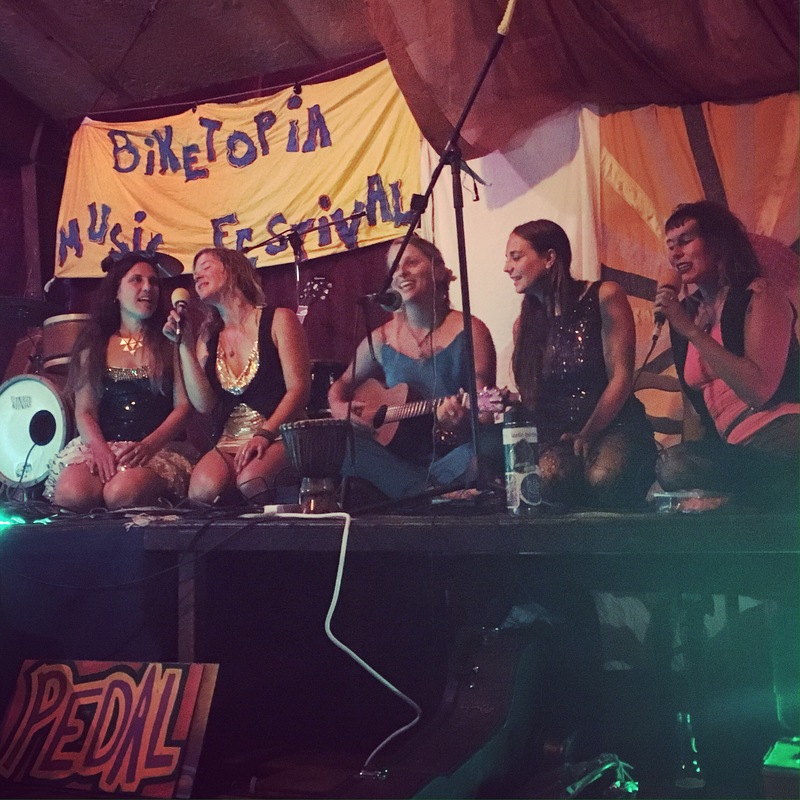 We are called the Pleasant Revolution and put on Biketopia Music Festivals all over the world. 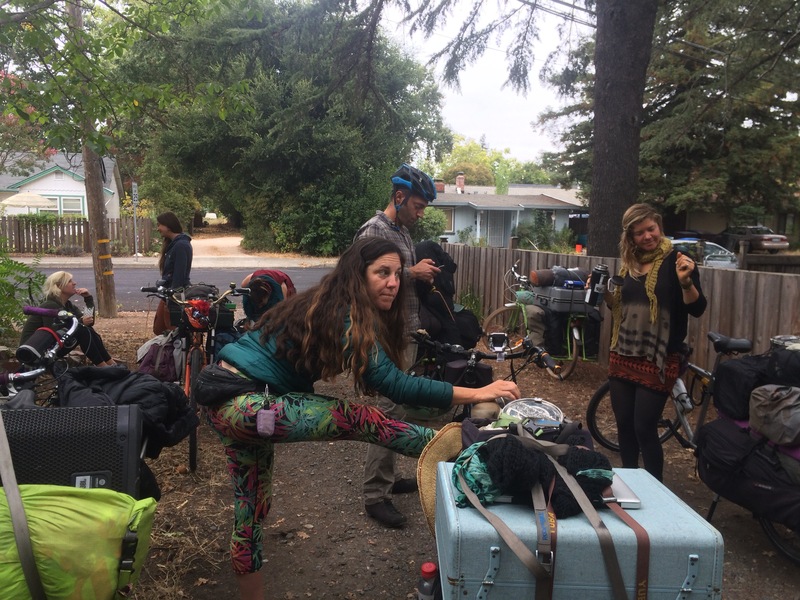 We each had loads on our bicycles consisting of microphone stands, stilts, food, stove, pots and pans, 2 amps, a subwoofer (80 pounds made into a trailer), cables and more! At the end of the tour, I personalized the people that went on the entire tour into a drawing. We all had large bicycles making it possible to pull anywhere between 100-180 pounds. 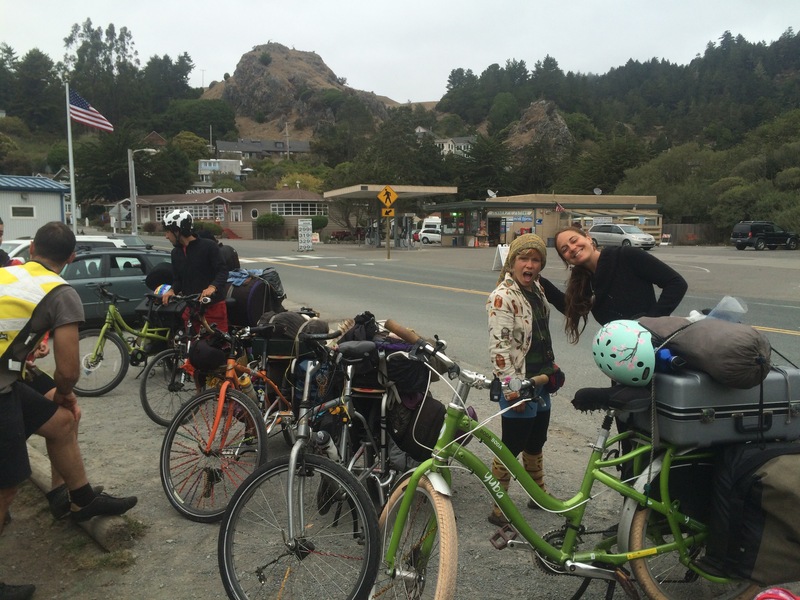 What is so challenging about bike touring? It forces you to slow down. If you need to ride 45 miles (which would normally take an average cyclist 5 hours to bike) in a group, it takes three times that amount. So you are slower, there is no destination because if you focused on that you would constantly be stressed and worried about getting there. In this specific community, you had to let go and enjoy. Swim, eat, talk, play music, and let things go with the flow. Sound easy? It was life changing, but with all that down time and time on a bicycle makes for some great reflection and inner work. I love cycling alone but with other people, it’s immensely powerful. I think its something that everyone could benefit from. You have to be strong physically but even more important, mentally. Balanced and rationale and put the group first. 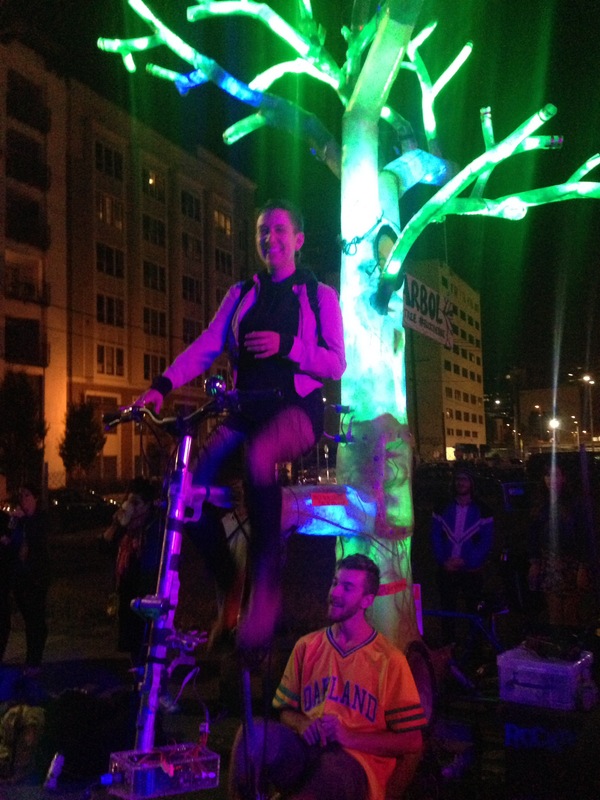 Here you can see the humans pedaling/making the electricity for the music. The bicycles have individual generators on the back wheel that are connected to a utility box designed by Rock the Bike in Oakland. From the utility box, you have output to the speakers and microphones. Pretty incredible! Leave no trace. Become a steward of the earth- pack it in pack it out, clean up after others, dig a hole when you poo, gather wood in a considerate manner. Be an active guest- consolidate your belongings, do a chore, cook a meal, give a gift. Make your impact on someone’s space neutral or better than when you came. We offer the highest musical and performance content. Use music and performance as a political platform whenever possible. We work to uplift the feminine in all of us to move beyond the patriarchs well as the binary to create balance in our group and ultimately in society. We work to embody nurturing, supportive, loving energy among us. We respect to act in the highest regard for the webs of all life. We operate on modified consensus- everyone’s voice matters and we won’t move forward on a decision if some have a strong block, however, if one is willing to stand aside even if the decision being made is not their preference the group will move forward with the decision. We work to educate and inspire the communities we travel through on fossil fuel alternatives. We work to be a living example of sustainable living. Everyone should strive for direct heart centered communication. We should address conflict on a person to person basis, if the group needs to be called in we will facilitate that. Take it to the source. Everyone should be emotionally responsible for themselves, able to employ de-escalation skills on themselves when necessary. This is a Group lead tour- every person is a working part and doing their part. 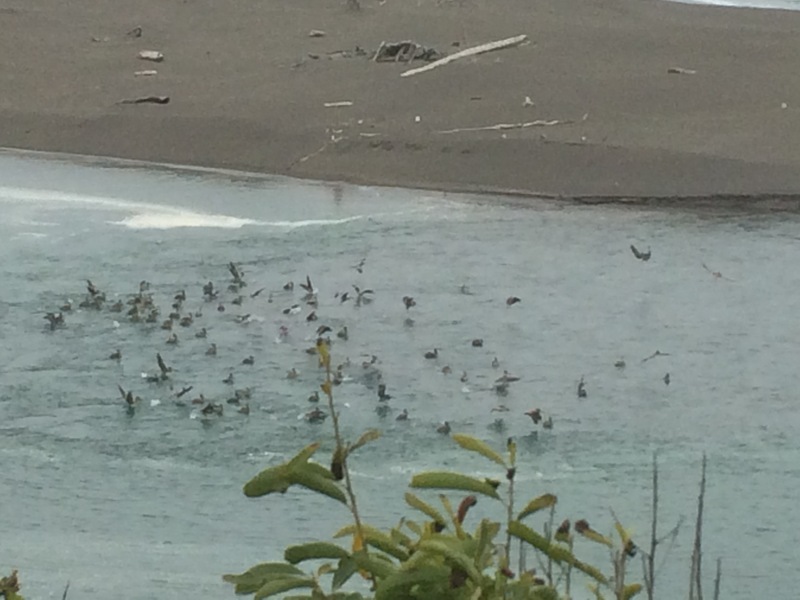 This is truly living interdependence. We all have the opportunity to lead and be led. We work to uplift everyone’s strength while also challenging growth in each individual. Always do your best and have fun! Here is the extra cycle Novara bicycle I rode for the tour. 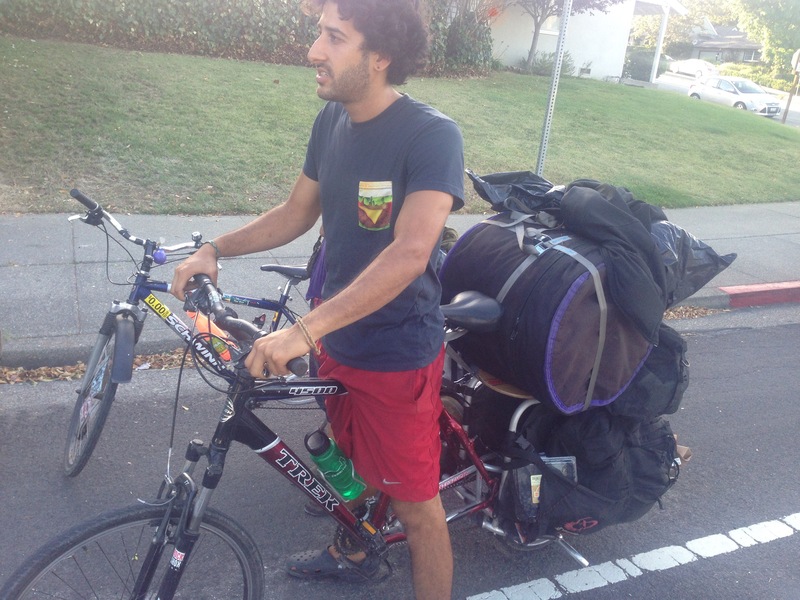 You can see the frame is extended backwards making the bicycle into a cargo bicycle. Her name is Gunther! Can you find the stilts? We are talking about a 2018 6 month Europe tour that we already have a solid group of 20 cyclists for and I am already planning on making some murals for the tour and getting funding to make community art projects happen. Why do we start planning something almost 2 years away? We need funding, sponsorship, grants and more. It is great timing for booking festivals and for planning out the route and logistics. I look forward to it. We made it back home! Can you believe it? All the way from Seattle to Bellingham, Vancouver, Salt Spring, Victoria, Port Angeles, Port Townsend, Whidbey Island, Bainbridge Island, Seattle again, Olympia, Portland, Eugene, Brownsville, Coos Bay, Florence, Fort Bragg, Jenner, Santa Rosa, Sebastopol, and Oakland! The last couple of days were wonderful, annoying the last moments. 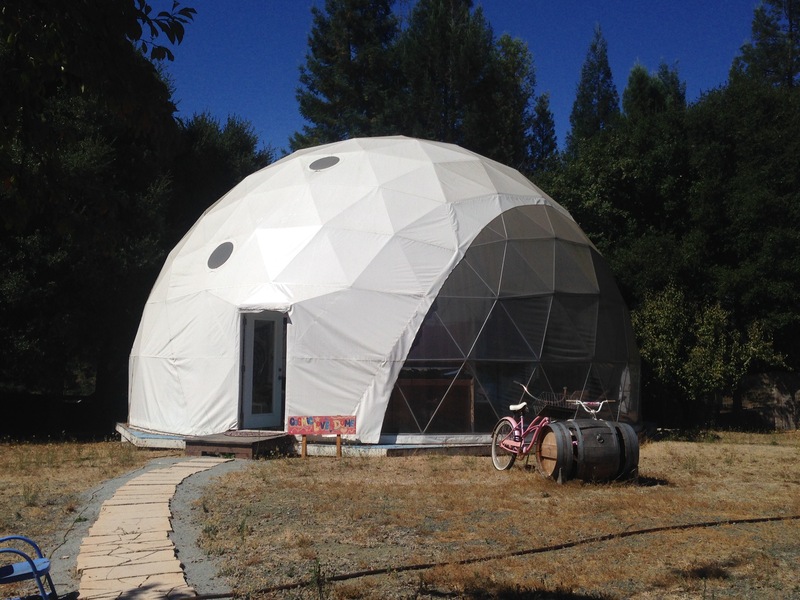 We ended up staying at a geodesic dome in Sebastopol with a pool for Nates birthday. We had a beautiful brunch in the morning to celebrate and rode a couple miles to our Petaluma to play our Farmers Market show. The show was incredible, we were overwhelmed with all of the food that we were gifted to the crew and we loved playing! 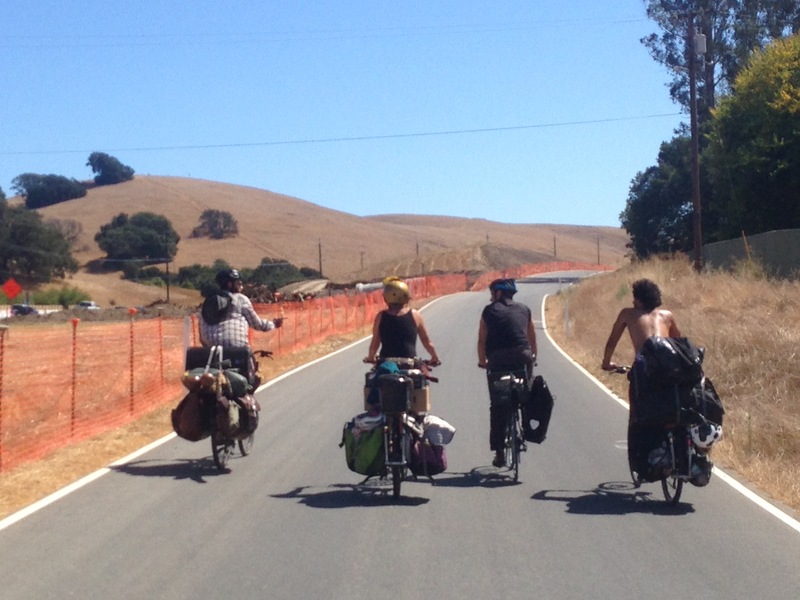 On our way home, we were lucky enough to go by Yuba Bicycles headquarters in Petaluma and get a tour and talk to the people that work there. We test rode some bicycles. 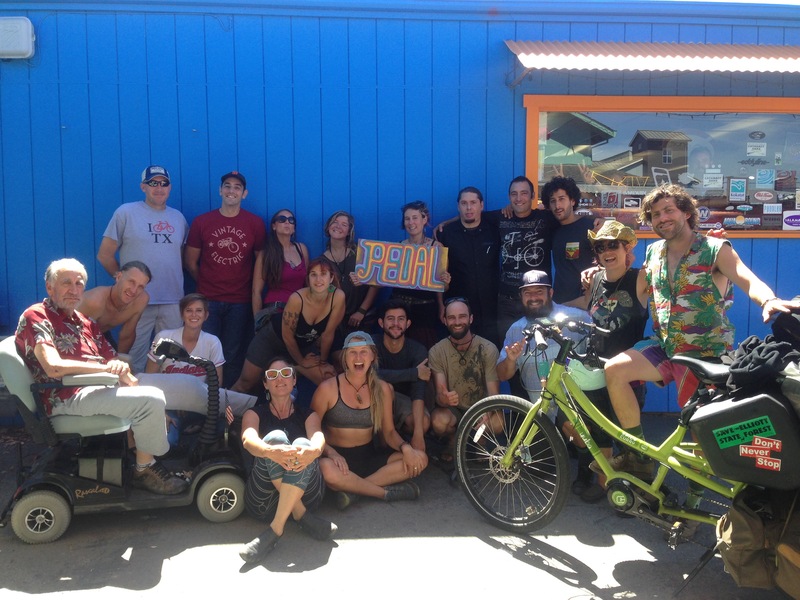 Two of our 10 extra cycles were from Yuba so we were happy to provide feedback and hang out with them. 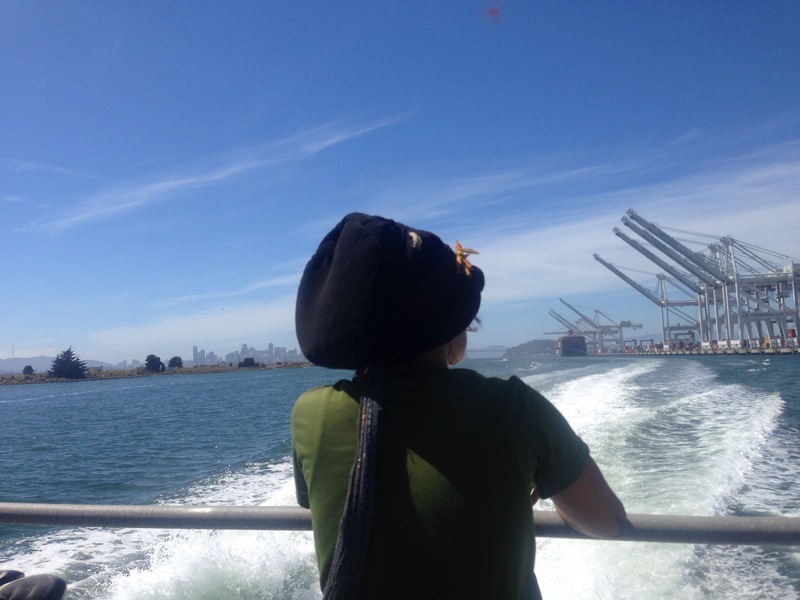 For the final 20 miles, we decided to take a ferry into San Francisco. 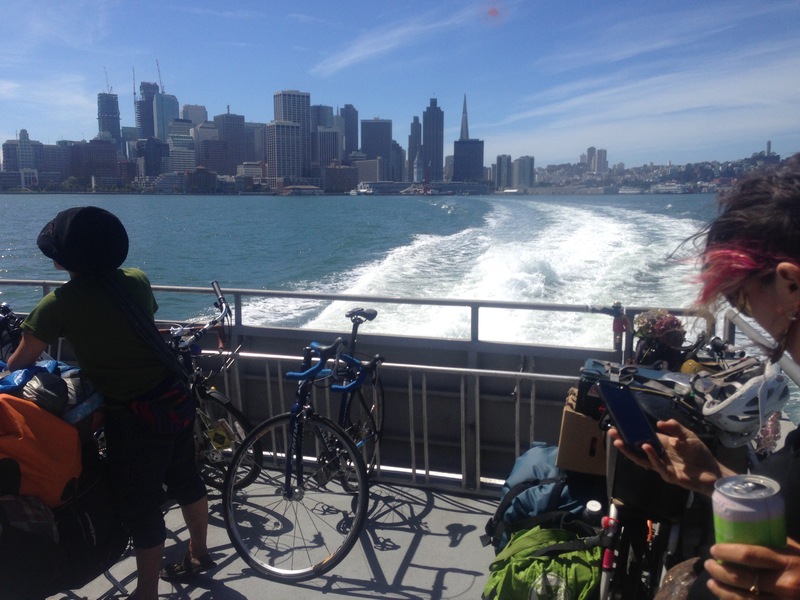 We were able to fit all of our bicycles and it was my first time to get into San Francisco that way. We were all so excited to see the city and it felt so weird to see that familiar city skyline. It had not really sunk in until that moment for me. We are home. My bed is close by. We are not sleeping in tents anymore! It was a very strange feeling I can not quite describe it. BUT! Our shows were still not over, we had two more to play and decided to stay together as a group at night to not end the energy or disperse. 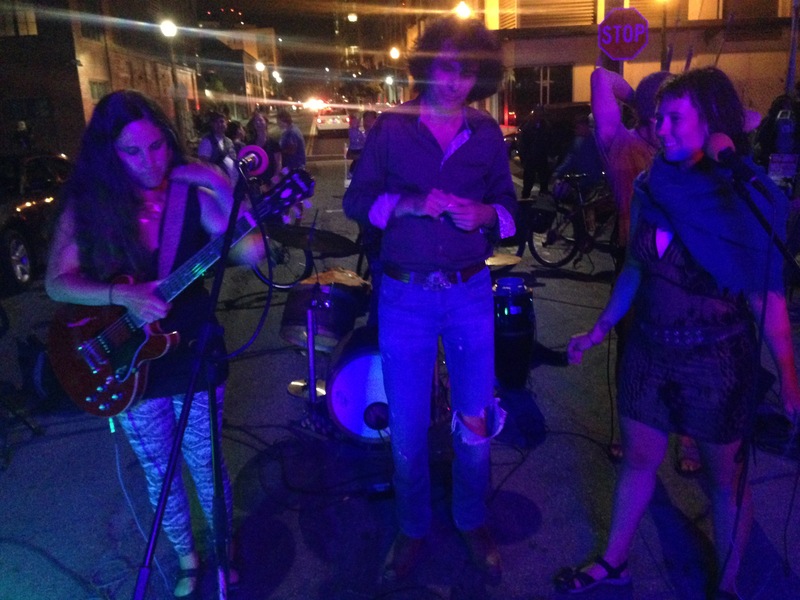 We played a Friday night gig at Oakland’s art walk called “First Fridays” and we had a 10 bicycle system instead of our typical 4. There was also a huge double decker bicycle called “El Arbol” or “The Tree” that lights up and is also a generator bicycle as well. It was a beautiful show and we had an incredible turnout. The second and final show that we had was at PLACE for sustainability where we had all the acts of the tour players, and I even got to sing a song. It was a blast and we spent the night all together to keep the tour going! The next day, it was hard to part and felt very odd. I still can feel the feeling but not quite put it into words. Pedaling away from everyone after almost 3 months of being together anywhere from 10-2o people at one time. We really loved the tour, hanging out with each other all the time and playing music with one another. We are even talking about riding 6 months and playing shows in Europe 2018 summer and there are still more plans in the work for the future of the tour! Thanks for reading and following. This tour has been a blast BUT there is more to come so stay tuned. Leaving the coast was a much needed break from hills and from the dew filled air. The coast has such a dramatically different feel than even 5-10 miles inland. 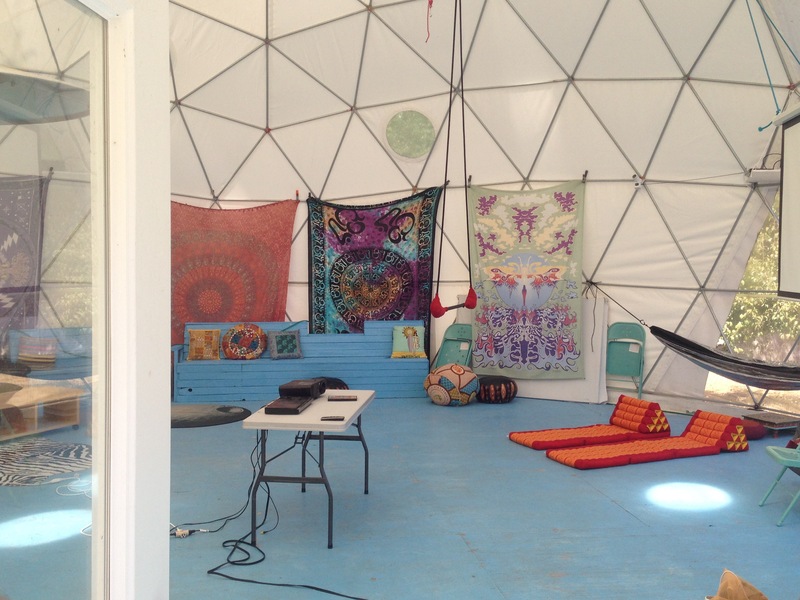 Jenner was beautiful, we met a man that owned the community center, and he let us stay at it. Everyone in the town of a population 136 were so nice and welcoming. 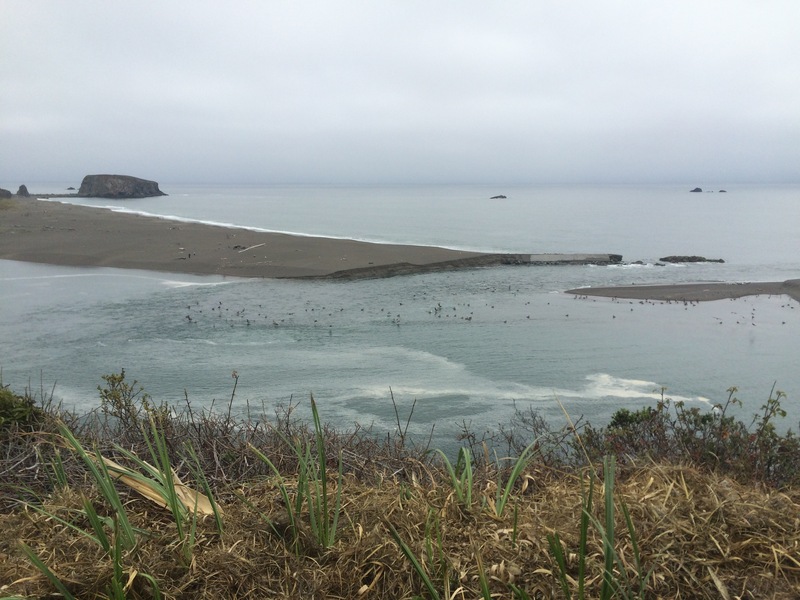 The town lays at the mouth of the Russian River and is on the Pacific Ocean. The state route highway 1 runs through it, as well as the 116. Typically heading inland there are a lot of hills, but to our surprise we didn’t hit any! 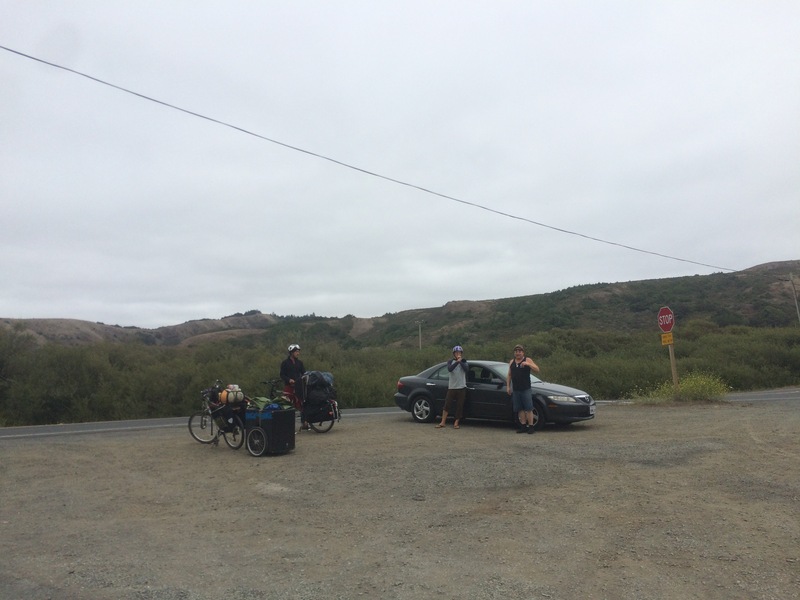 We passed through Gurneville and had a beautiful dip into the Russian River and had some lunch before hitting into Santa Rosa, wine country and lots of traffic and cars! 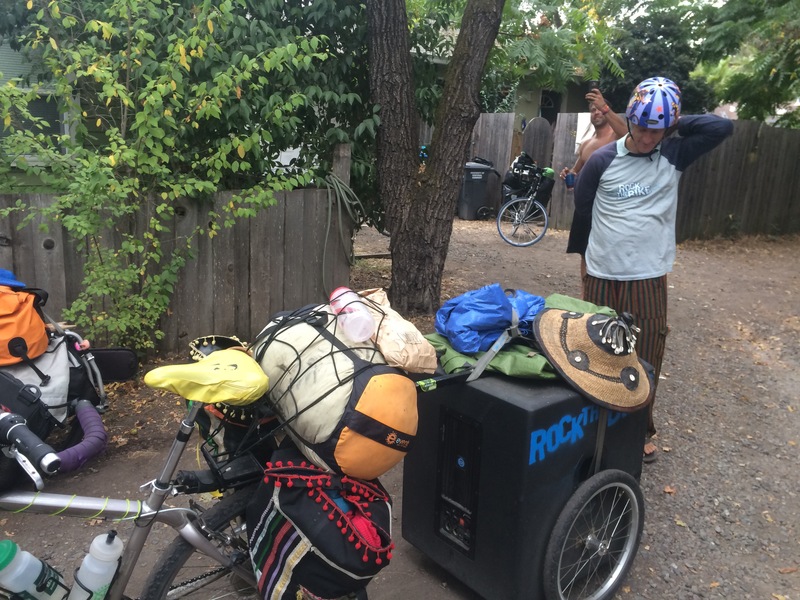 Santa Rosa was amazing, we got to stay with Carolyn’s brother, Sean. He had a house and he let us stay in his driveway with our tents. 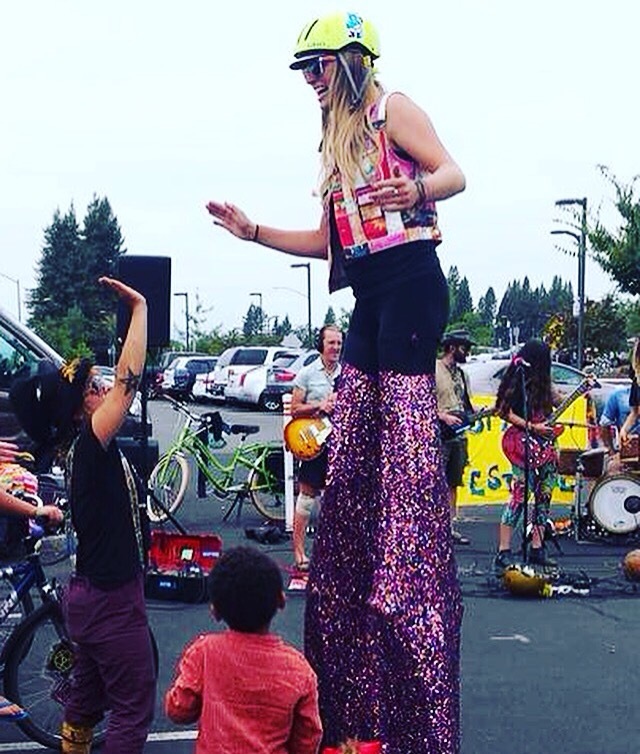 We played a show at the Santa Rosa farmers market. It was amazing, we had a lot o participation and her brother came as well. We did a little wine tasting, a lot of riding and the anticipation of arriving at home is at the forefront of our thoughts! We are really trying to enjoy every moment. Less than a week left!